Holloway Structural Steel Rolling Services has been in the business of rolling steel and any other type of metal for over 20 years. We provide structural steel rolling and for use in the aerospace, architectural, industrial, transportation and commercial industries. We provide rolling for angles, square and rectangle tube, channel, t-beams, I-beams, wide flange beams, flat bars, pipe, rails, tracks and any other metal. If it's steel or any other metal we can roll the items you need. Holloway Structural Steel Rolling Services offers a unique blend of experience and rolling equipment to make sure your job is done preciously to the measurements required. We offer a mandrel system for square and rectangular tubing that limits any distortion when rolling. We have the know how to roll your material correctly and on time. If you need an expedited job we offer break in services that can get your material rolled and you out of a bind. 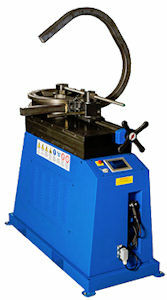 Holloway Company has recently acquired the Ercolina TB130 Top Bender® tube and pipe bending machine. This machine is ideal for producing consistent quality bends in large pipe, tube, squares, solids and other profiles. It gives us the capability for small bends, multiple bends and creating davit arms. Tube (Min.) ¼", (Max.) 5"
Centerline Radius (Min.) 2 x Ø, (Max.) 27½"
1/2" x 1/2" x 1/8" thru 2 1/2" x 2 1/2" x 1/2" 2'0"
3" x 2 1/2" x 3/16" thru 6" x 6" x 1" 3'0"
8" x 8" x 1/2" thru 8" x 8" x 1 1/4" 8'0"
3" x 2 1/2" x 3/16" thru 6" x 4" x 3/4" 3'0"
*7" x 4" x 3/8" thru 9" x 4" x 1/2" 8'0"
*4" Leg In or 4" Leg Out 3'0"
1/8" x 1/2" thru 6" x 40"
1/8" x 1/2" thru 3/8" x 2 1/2" hard way 2'0"
3/8" x 3" thru 1" x 6" hard way 3'0"
1" x 8" thru 2 3/4" x 12" hard way 8'0"
2 1/4" thru 3" 3'0"
3 1/2" thru 8" 8'0"
8 1/2" thru 12" 16'0"
2 1/2" thru 6" 3'0"
1/2" x 1/2" x 14 GA. thru 2" x 2" x 3/16" 2'0"
2 1/2" x 2 1/2" x 11 GA. thru 4" x 4" x 1/2" 3'0"
*6" x 6" x 1/4 thru 14" x 14" x 5/8" 8'0"
Square tube larger than 14", call for rolling requirements *Mandrel System available for tight radii, call for tangent req. 1/2" x 3/4" thru 1/2" x 2 1/2" 2'0"
1/2" x 3" thru 6" x 3" 3'0"
6" x 4" thru 20" x 12" 8'0"
1/2" x 3" thru 6" x 2" x 3/16" 3'0"
6" x 3" thru 14" x 8" 8'0"
S3 & W4 thru S12 & W14 x 38# 3'0"
S15 & W14 x 43# thru W36 x 210# 8'0"
Any beam with 11 3/4" flange and larger thru W40 x 328# 16'0"
S3 & W4 thru W6 x 25# 3'0"
S7 & W8 x 13# thru W14 x 68# 11'0"
WT & ST 1 1/4" thru WT & ST 3" stem in & out 2'0"
WT & ST 4" thru WT & ST 6" stem in & out 3'0"
WT & ST 7" thru WT & ST 14" stem in & out 8'0"
3" thru 6" flanges w/stem up or down 3'0"
7" thru 13.5" flanges w/stem up or down 8'0"
15" thru 18" flanges w/stem up or down 20'0"
C3 x 4.1# thru C12 & Mc12 3'0"
C15 x 33.9# thru Mc18 x 58# 8'0"
C3/4 x 3/8" thru 2 1/2" x 5/8" 2'0"
C3 x 4.1# thru C6 x 13# 3'0"
*C8 x 11.5# thru C10 x 25# 11'0"